Snow and Ice Cleats | Classical | SNOW GRABBERS Series | Jia Hao Plastics Factory CO.,LTD. Avoiding slips and falls on ice with anti-slip snow cleats. Excellent traction with special non-slip studs can reduce the risk while walking on slick surfaces. Made of TPR provides anti-slip function. Two sizes are available to fit over your footwear comfortably. Avoiding slips and falls on ice. 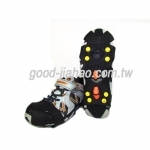 Excellent traction with special non-slip studs.